We have watched with pride as Mad Men’s Peggy Olson has risen from the ranks of treading water in the secretarial pool to swimming with the big fishes on Madison Avenue. As the Mad Men at Sterling Cooper & Partners implode all around her, Peggy’s star is rising. Last seen sitting behind Don Draper’s vacant desk, one wonders, who’s wearing the polyester pant suit now? 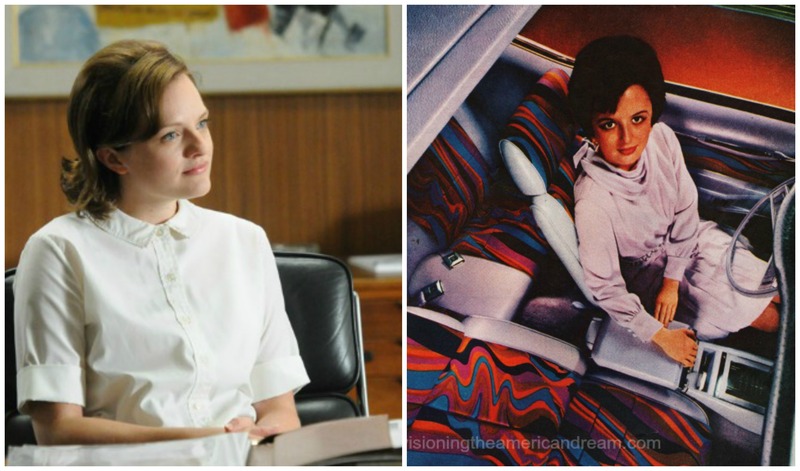 You’ve come a long way, Peggy Olson, from Miss Deaver’s Secretarial School to head copywriter at SP & Partners. 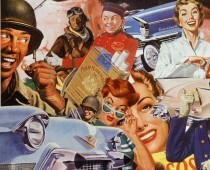 In season 5 when Peggy became the new chief copywriter at a rival Madison Avenue agency after leaving Sterling Cooper Draper Pryce in the dust, she was handed Phillip Morris’s latest offering to the world of smoking -a cigarette especially for m’lady. 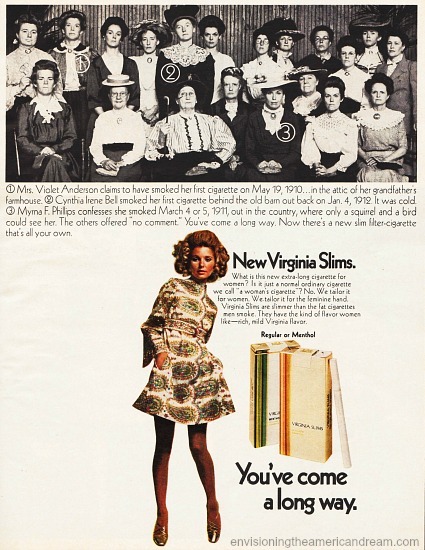 It was a top, secret as yet unnamed women’s cigarette which of course we all know would be the Virginia Slims Cigarette account. 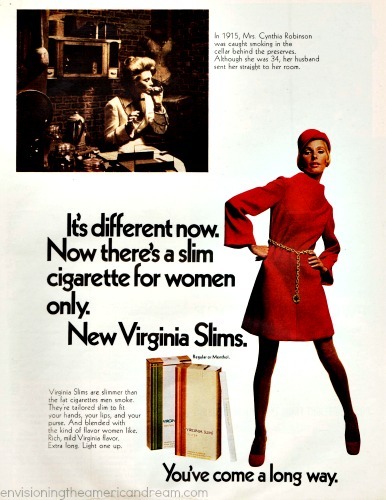 These new cigarettes were slimmer than the fat cigarettes men smoke, and were tailored slim to fit a lady’s hand, her lips, and her purse. The formulaic ads followed the same theme-bold images of a glamorous, fashionably dressed liberated woman contrasting with pictures of early 20th century women being reprimanded for being caught smoking by their husband or some other men. Since it was marketed for the young professional gal, who better to manage this up and coming account than up and comer young professional Peggy Olson, who being single would be willing to work weekends, evenings and holidays. But it wasn’t all work for single career girls like Peggy. Making the scene in groovy go-togethers, her eyes smudged as if with crayolas in iridescent jewel tones of turquoise and sea green, her Yardley slickered lips wet and wild, we got a glimpse this season of Peggy Olson as Vixen by Night. It was clear she was ready to get uninhibited, get liberated and go –go completely Mad! Fast forward to the final season of Mad Men. 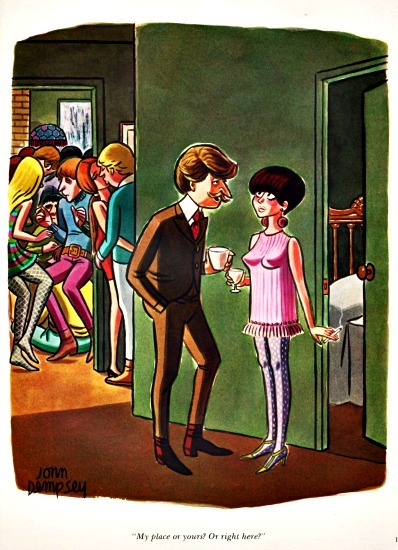 It will be 1969 and the sexual revolution was about to get into full swing. Romance and motherhood would become so so passé. You’ve come a long way baby…and babies were definitely not in the picture. Wake up sister, there was a whole new world out there. Suddenly it was a liberated world of New Freedom and Peggy would be ready to dive right in to the swinging world of singles. Busting out of her cocoon, and swinging in a butterfly sleeved-A lined mini skirt, Peggy would have her pick from the plethora of dimly lit, Tiffany lamped, singles bars that lined Second and First Avenue on the Upper East side of NY, foregoing the watering holes of the wild, wild west of her own Upper West Side neighborhood. You’ve come a long way from Bay Ridge Brooklyn, Peggy. These new liberated ladies were shedding their inhibitions as quickly as they shed their polyester clothes. There was no place for squares- virginal Sleeping Beauties were a thing of the past. Gone was the bad girl the one who went all the way and wrecked her whole life. Suddenly it seemed it was a Cold War world of Cosmo girls ready to shake your world, a strange new world of pills and panaceas, of living together, of vibrations and of sexual openness. Uninhibited, stepping out in a leggy little Mary Quant slick and shiny vinyl miniskirts these chicks were girdle-free-garter-free-free-to be you-and-me: they were part of the new freedom generation, a beltless, pinless, fussless generation. Puffing on her pretty as a picture New Eve cigarettes ( like Virginia Slims, cancer made especially for the ladies) the liberated lady lit her own cigarettes and opened her own doors. (R) Vintage ad for Massengil Feminine Deodorant Spray “Freedom Now! 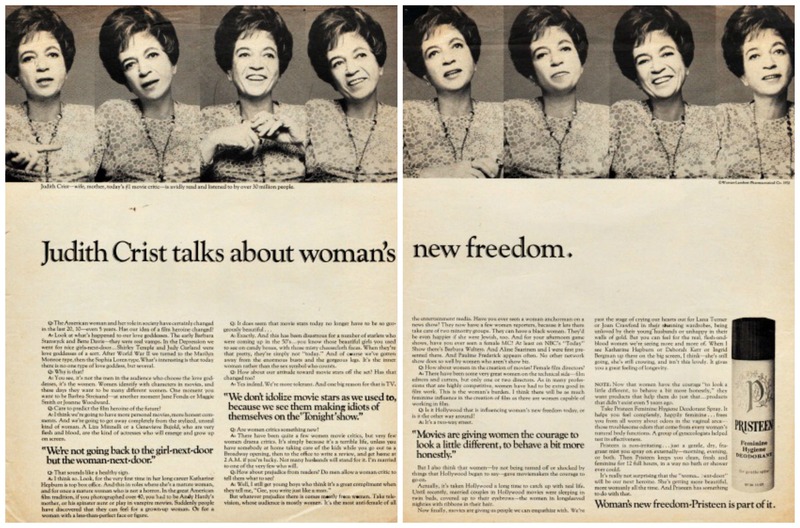 The ad claimed their product was the better way to be free to enjoy being a woman.” You like freedom don’t you?” they asked. A seasoned copywriter and smart cookie like Peggy would likely snag onto the hottest new products being marketed to the liberated lady in 1969. Feminine Hygiene Products. 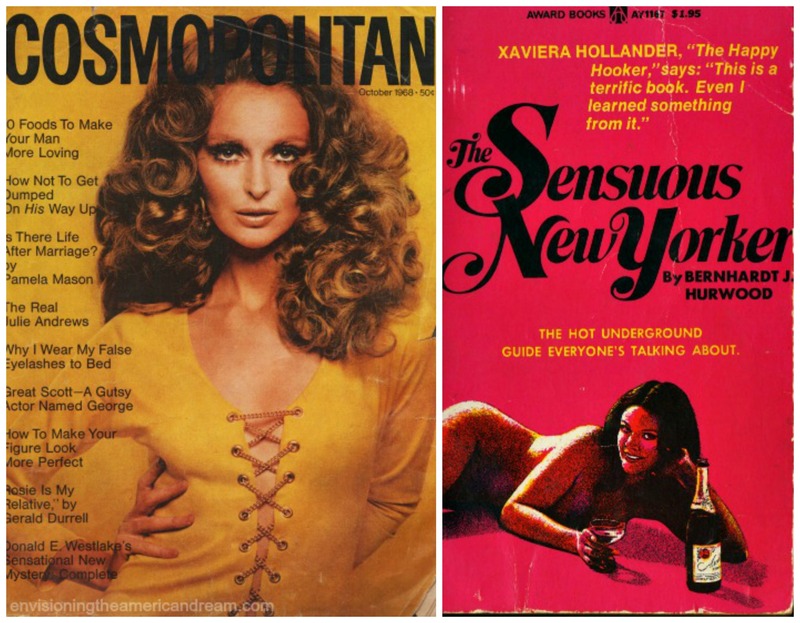 The newly liberated Cosmo Girl could come on strong. Sexual freedom came at a price. The drug and cosmetic industry expanded from the underarm deodorant to a more private part of the body. The most “girl part” as they described it. The problem that had no name only 5 years earlier now had a slew on products to help a liberated gal feel confident and feminine. By 1969 being confidently close was never nicer. “It’s a freer, more natural, more out in the open world and we’re on you’re side,” the makers of new Feminine Hygiene sprays assured women. 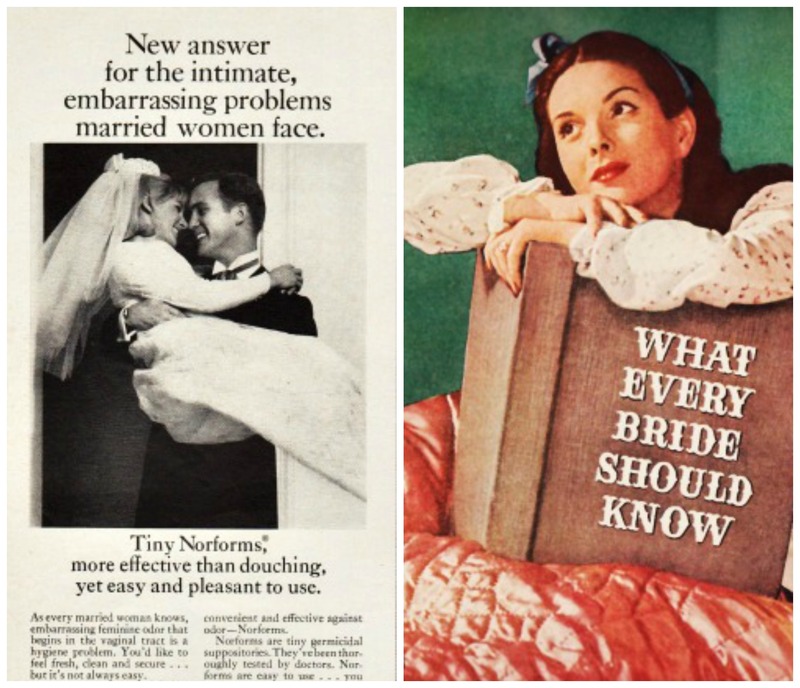 The age-old problem of “intimate embarrassing odor problems” once faced only by married women whose husbands wanted their wife to be feminine…in every sense of the word, was now the sexually active liberated ladies dilemma too. This was the dawning of the age of FDS. A welcome new addition to the world of feminine freshness, was this personal deodorant for the ultimate social security. It was, manufacturers were hoping, to become as essential to the new woman’s daily life as a bath and shower. Making the scene with FDS was Feminique. 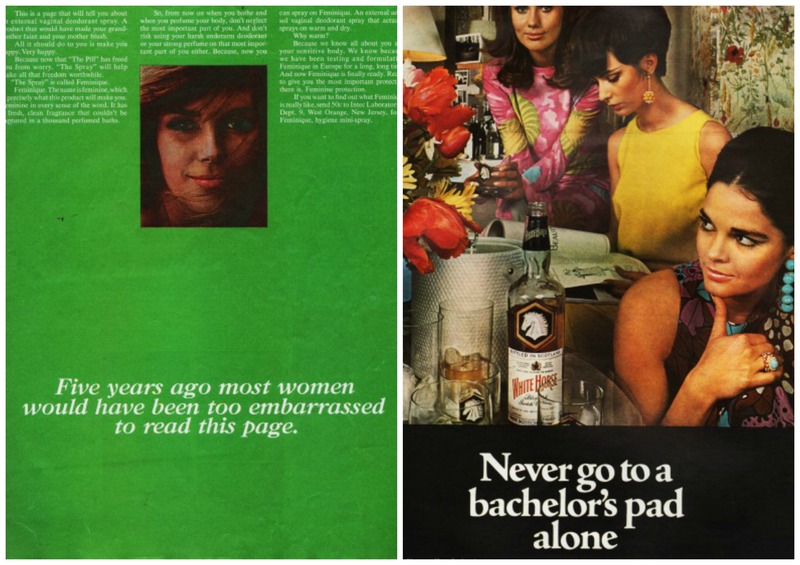 Their full-page ad announced provocatively: “ Five years ago most women would have been too embarrassed to read this page”. 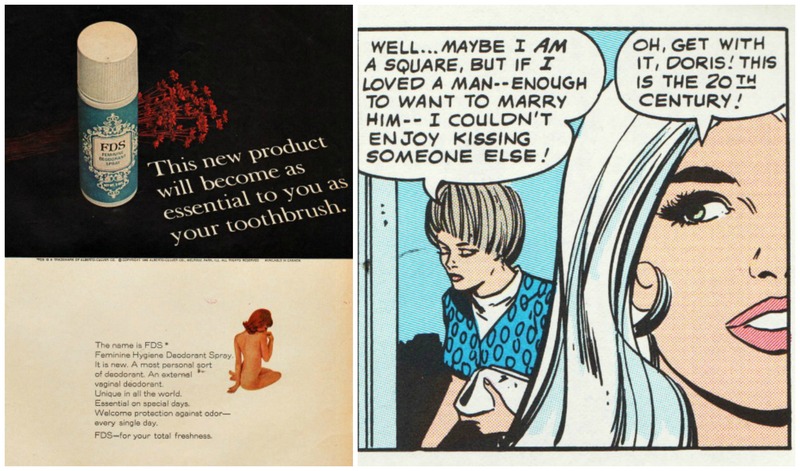 No one marketed Feminine Hygiene Sprays more aggressively than Pristeen made by Warner Lambert pharmaceuticals. In 1969 they ran a series of bold ads for the little lady with the headline “Unfortunately the trickiest problem a girl has isn’t under her pretty little arms”. 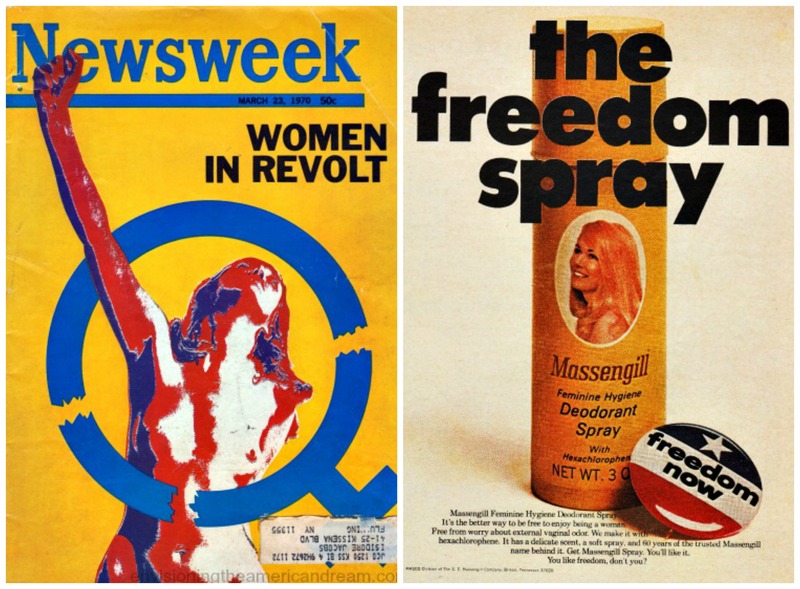 By 1970 there were 30 brands of feminine deodorant sprays on the market and Americans were spending well over $67 million annually in an attempt to be more “feminine”. Unintentionally Gay Ads Does He or Doesn’t He? 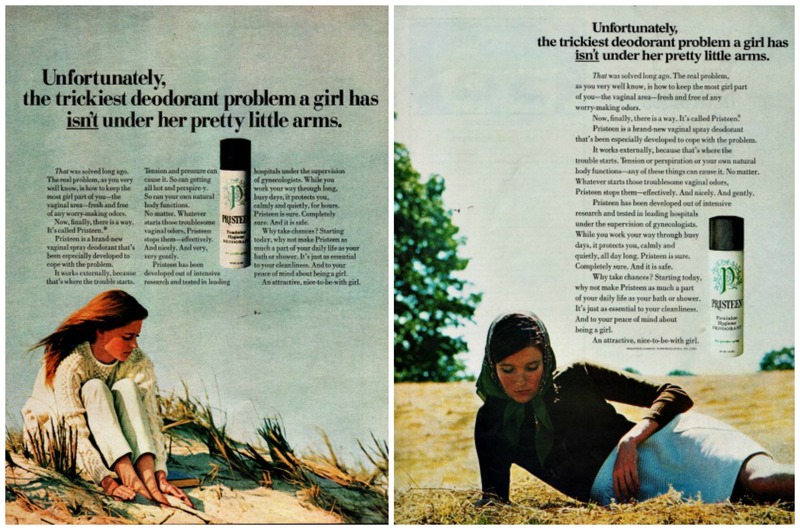 As a young woman ~ in her early to mid-teens ~ in the beginning of the 70’s, I was confused at this sudden onslaught of advertising slapping us right in the face about an “odor problem” that hadn’t existed just a few years prior. Even at 14, I was savvy enough to know that if there was a noticeable (by me, anyway) “odor problem” that didn’t get taken care of by a daily shower allowing the liberal application of soap and water, it was time to go to a doctor, not the topical spray department at the pharmacy. I pretty much figured it was going to be a LONG time before any male was going to have any business being that “up close and personal” or any right to comment on something so incredibly private. Say, after the legal application of the plain gold wedding band, and I had a LOT of things to do before that was going to happen! Besides, if the good Lord had intended for us to smell like a Florist’s Shop “down there” He would have taken care of that from the beginning. Underarms were a little different ~ they were much closer to nose-level than our “whatsits”! So, I never bought into all that floral nonsense, and probably saved myself a whole lot of money and self-inflicted gynecological woes in the process! I guess I was just blessed with a healthy dose of Common Sense that many of my more self-conscious “Sisters” were not.